The Bath based Mr B’s has everything you’d expect from a quirky independent bookshop: a cool name, a friendly team (each member with an encyclopedic knowledge of books) and a cosy interior. … But it also has a cracking online presence. 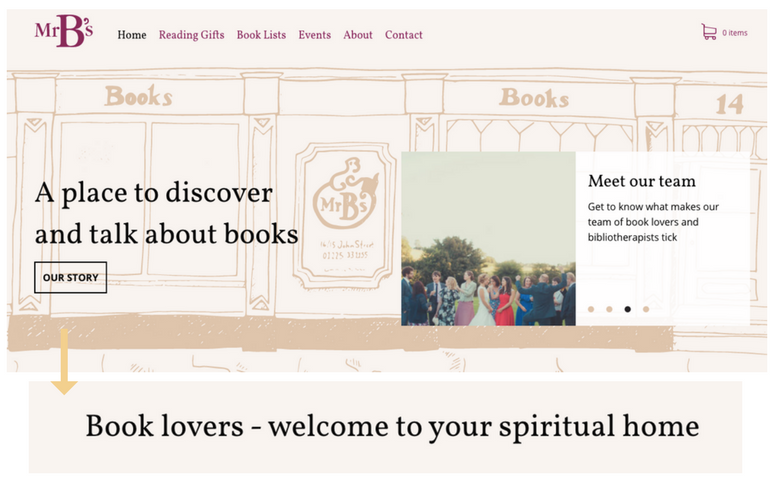 As soon as you land on the shop’s homepage, you’re greeted with the call-to-action (CTA) “Our Story”, which, once clicked, opens a new page with the heartwarming message: ““Book lovers - welcome to your spiritual home”. The use of such descriptive and enthusiastic language successfully makes a first-time visitor feel like they’ve just been invited in for a cup of tea by "Mr B" himself. But it doesn’t end there. 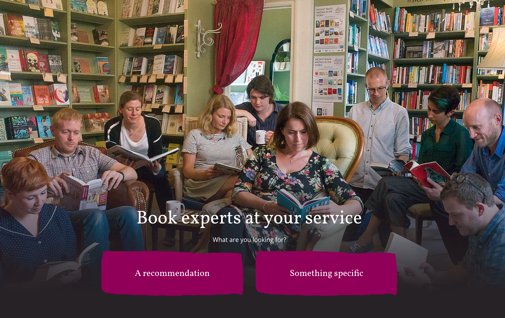 With a long page design, a quick scroll down the homepage leads to a recommendation service where a customer can either request “a recommendation” (by filling out a short form about their taste in books) or “something specific”. Whilst we don’t think, on this occasion, machine-learning algorithms are behind the thoughtful answers to these requests, it’s a pretty brilliant initiative and makes room for plenty of customer-retailer interaction. Take-away: Whilst an aloof tone may suit the cutting-edge nature of your brand, making customers feel completely welcome and part of your brand goes a long way. According to BAMB, most book buying decisions are made by customers inside a bookshop, so it’s likely many customers on your site will just be window-shopping. To keep first-time visitors engaged with what your store has to offer, make your newsletter signup box as prominent as possible. 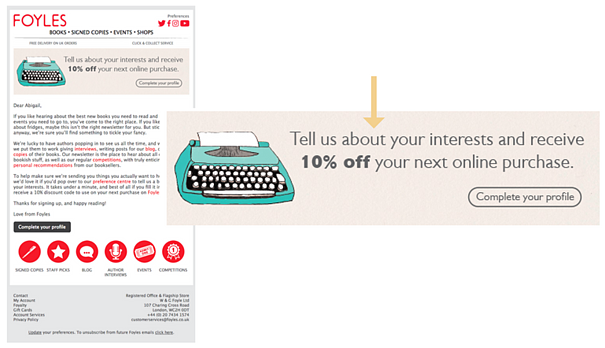 One way to do this is to create a popup (for ideas and inspiration on how to go about doing this, check out this blog post), but another way is to invest time in thinking about the message and appearance of your signup box. Here’s a nice example from Blackwell’s; the store opts for a classic typography that has a handwritten feel, and assures a browser they can unsubscribe any time and there’ll be no spam. Take-away: A bewitching newsletter signup box can make the difference between a one-off visitor and a lifelong customer. Once a visitor has subscribed to your newsletter, the next step is to send them a welcome message. Automated welcome emails are a golden opportunity to not just thank a recipient for signing up, but to also tell them a bit more about your store and learn more about them in return. For example, Foyles’ welcome series kicks off with a 10 per cent off discount accompanied by a CTA asking the recipient to tell them more about their taste in books. 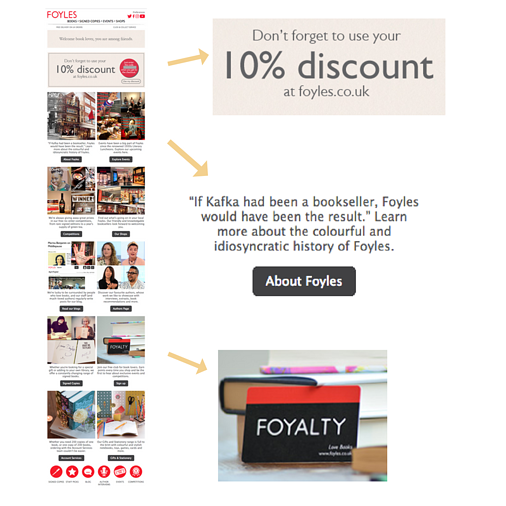 The bookshop then sends a second email a few days later, reminding the subscriber of their 10 per cent off discount (if it hasn’t been used yet) before going into a bit more detail about the store’s history, events, competitions and loyalty scheme: Foyalty. By finding out the genres its customers are most interested in hearing about, Foyles can tailor the content of any future correspondence around what’s likely to resonate with each recipient best. Take-away: Remember: the average open rate for welcome emails is 50 per cent, which is 86 per cent more effective than email newsletters. Are you really making the most of yours? You’d be forgiven for thinking that the older a bookshop is the less technology-savvy it will be, but The Folio Society is one publishing house proving that wrong. At 70 years old, the company continues to create beautiful editions of the world's greatest literature, but now also has its own ecommerce site which is home to over 40k likes on Facebook. 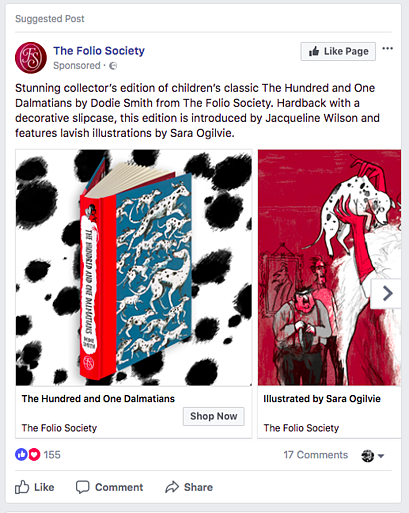 The Folio Society demonstrated some cross-channel marketing finesse after we signed up to its newsletter recently, retargeting us with a sponsored post inviting us to "like" its Facebook page (as shown below). By reaching out to customers via their favourite touchpoint/s, a retailer is more likely to connect with each one and spread the word about what its brand has to offer. Take-away: Cross-channel marketing is simple once you get the hang of it. If you want to read about how to get started, we recommend our blog post answering the question: "What exactly is cross-channel marketing in ecommerce?" 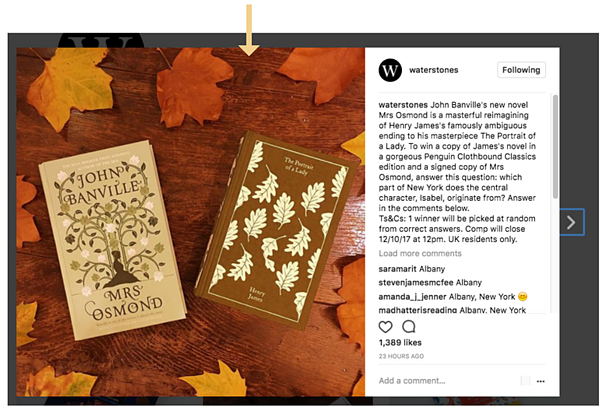 On the subject of social media, Facebook-owned Instagram is also an indispensable tool for booksellers today. Whilst The Folio Society has over 21k followers, Waterstones is nearing the 80k mark. So why is this channel so popular among book retailers and shoppers? Firstly, it’s a photo-sharing site with a focus on the visual, and therefore perfect for those who—like myself—enjoy spending time looking at beautiful book cover ideas. Unlike Facebook, there’s a real artistic side to the app, enabling marketers to publish stunning pictures of their books in different surroundings in just a few clicks. 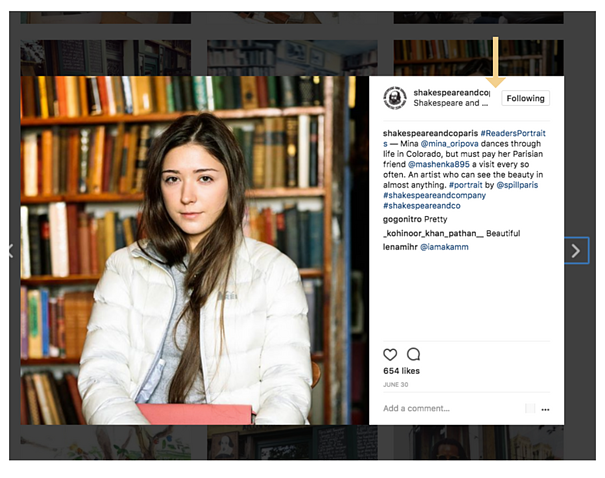 As well as being a platform for beautiful photos, Instagram is also a great way for bookshops to interact with book-lovers by hosting quizzes, photo-sharing campaigns or re-posting their followers’ content. Take-away: The great thing about engaging with your community on Instagram is that it's free (... it's also pretty fun). That said, running a popular and successful account does take a fair amount of thought, so we recommend thinking about your strategy before jumping straight in. Founded by the former fashion editor and publisher Carla Sozzani in Milan in 1991, 10 Corso Como describes itself as a “virtual narrative” that uses the “gallery and bookshop” model as its core. With such an artistic background, it’s no wonder that the bookshop’s ecommerce page is a sight for sore eyes. … 10 Corso Como proves that paying attention to the design of your site pays off. With numerous small but powerful quirks (such as the fluttering butterfly when you “add to cart”), the site's overall UX is faultless, with everything working exactly as it should—all at speed. 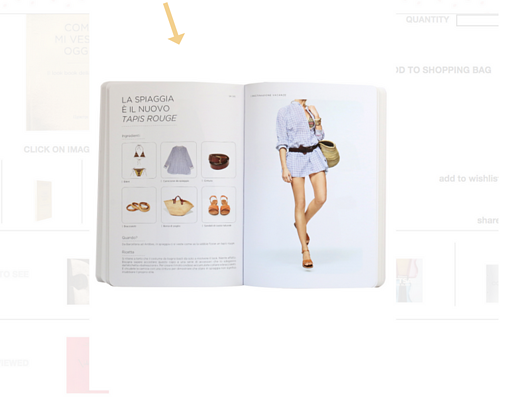 Take-away: Be as creative with your ecommerce site as you are with your bookshop. Carving a pumpkin for your shop's entrance for Halloween? Why not add a cobweb to you brand's homepage... You get the idea. Next up is Parisian bookshop Shakespeare and Company. Situated at 37 rue de la Bûcherie in the 5th arrondissement, this store has a rich history spanning almost one hundred years and is still the “Left Bank literary institution” it has always been known to be. But that doesn’t mean the legendary bookshop is averse to embracing what technology today has to offer. 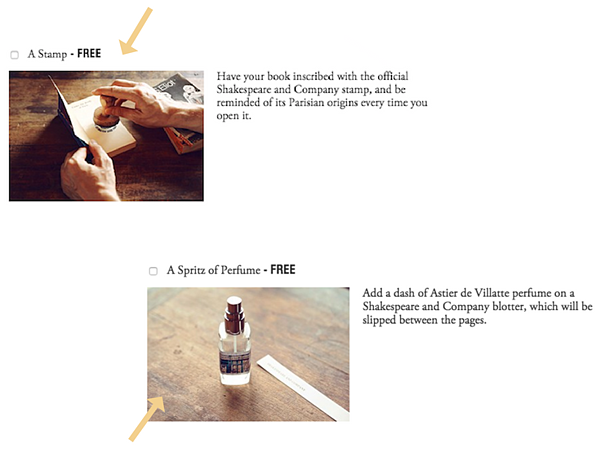 The bookshop manages to evoke something of the authentic in-store experience by giving online shoppers the option of having their book(s) inscribed with its trademark stamp and spritzed with its perfume during the checkout process. This not only adds a drop of personalisation to a customer’s order, but also enables the bookshop to sell online without sacrificing its uniqueness and sense of identity—something that smaller, independent brands sometimes fear when shifting to ecommerce. Take-away: Think about the different ways you can capture the essence of your brand through a digital lens. Last not least comes Daunt Books. Founded by James Daunt in 1990 in “in the beautiful Edwardian premises at 83 Marylebone High Street in London”, this independent bookseller is known for its stunning shops dotted across London which often play host to prestigious talks and events. When shopping online, Daunt Books doesn’t lose the attention to detail and sense of perfectionism felt in-store. 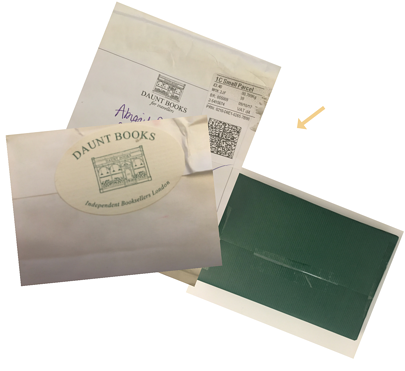 Having purchased a gift from the bookshop recently, the parcel arrived in an envelope that had a handwritten name and address and was sealed with a special Daunt Books sticker. Inside, the book was wrapped in that familiar forest green found in its branding. Take-away: The happiness we experienced receiving this beautifully presented parcel reinforced how important it is to always put thought into how you can please your online customers in the same way you do offline. We all know that, thanks to a growing number of pure-play retailers, it’s an uncertain time for smaller shops operating mostly offline. We hope this post has shared some of the more innovative ways retail marketers can embrace ecommerce and ecommerce marketing, without losing a sense of identity (or breaking the bank! ).